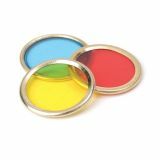 A combination of our most popular magnets in one fantastic kit! Includes one each of 1" horseshoe, 2" horseshoe, 2" bar magnet plus tubes of iron filings and steel shapes. Whether you're launching rings of fog, making a quicksand clock, or defying gravity with anti-gravity beads, you'll experience and engage with fantastic hands-on science in fun and creative ways. 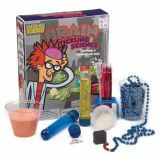 Your mind will be tingling with all of the awesome experiments and activities! 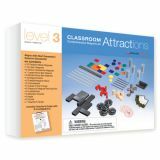 Supplement your science curriculum with comprehensive magnet kits aligned with the Next Generation Science Standards! Investigate motion and stability, matter and its interactions and more. Designed for groups of 5-10 students. 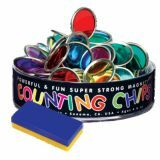 Includes 10 Magnet Wands plus plastic encased button magnets, magnet marbles, ring and disc magnets, bar magnet, metal rimmed counting chips, paper clips, pencils and teacher's guide. 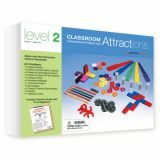 Supplement your science curriculum with comprehensive magnet kits aligned with the Next Generation Science Standards! 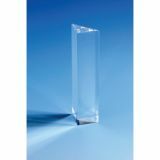 Investigate motion and stability, matter and its interactions and more. Designed for groups of 5-10 students. 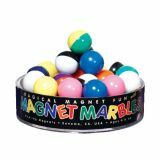 Includes 5 Magnet Wands plus plastic encased N/S bar magnets, block and button magnets, horseshoe and disc magnets, bar magnet, compasses, steel shapes, pencils and teacher's guide. 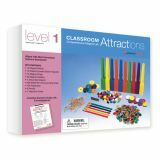 Supplement your science curriculum with comprehensive magnet kits aligned with the Next Generation Science Standards! Investigate motion and stability, matter and its interactions and more. Designed for groups of 5-10 students. 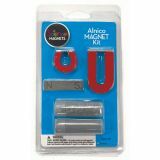 Includes block, disc, and latch magnets, horseshoe and bar magnets, flexible disc magnets, iron fillings, lodestones, magnet viewing film, compasses, nails, dowels, corks, demo bar magnet and teachers' guide. Build an electromagnet, electrical catapult, doorbell, telegraph and more! 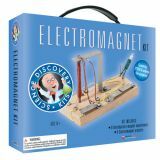 Includes neodymium and ceramic magnets, LED, switch plates and battery holders, iron filings, compass, wood blocks, hardware, other supplies and detailed activity guide. Do your friends get a “charge” out of you? Does your body transmit electricity? 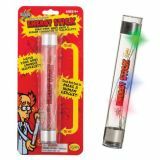 Use our new Energy Stick to find out! 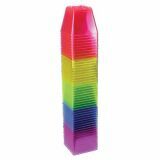 Hold the Energy Stick in your hands and see if it lights up and makes noises. Try it with two people, three people, five or more! A fun way to learn about conductivity, insulators and electric circuits.